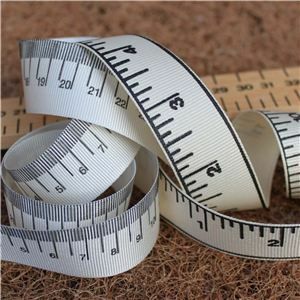 Tape Measure ribbon Do we measure up at Crafty Ribbons? We hope so. The custom made tape measure ribbon certainly will. Printed onto soft cream 23mm grosgrain ribbon in either metric or imperial measurements. The metric goes to 30cm showing all the detail of each cm while the imperial is to 12 inches with half, quarter and eight inch markings. The design is continually printed on one side of the ribbon.